Marly resides in Ontario, Canada with her family and their Yorkshire Terrier, Brynna. 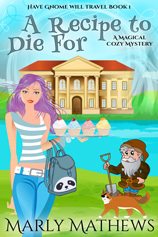 She writes regency romances and cozy mysteries. She has plans to write more fun and flirty regencies with ladies who have a nose for trouble, and men who have hearts of gold and delightful magical mysteries set in present day, where literally anything can happen and usually does.